Production of the all-new Peter Schreyer designed KIA cee'd Sportswagon has started at Kia Motors Slovakia plant in Zilina. We will be testing the new model on 12th/13th September. Demand for the new cee'd Sportswagon is expected to lift production at Zilina to 285,000 vehicles in 2012. The previous generation cee'd SW represented more than a fifth of the site's overall production. This year to the end of July Zilina has produced 167,000 vehicles and 266,000 engines, year on year increases of 11% and 52%. The new KIA cee'd 5-door, introduced earlier this year, is an extremely good looking car, by the Schreyer style Sportswagon looke even better combining a sophisticated exterior design with high-quality interior materials, fully independent multilink suspension and class-leading levels of refinement, with all chain cam 1.4 and 1.4 litre petrol and diesel engines. Loadspace of the Sportswagon is 528 litres seats up; 1,642 litres seats down. 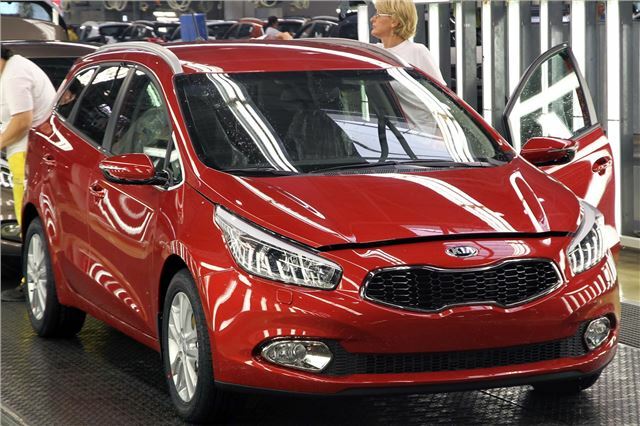 Kia's Zilina manufacturing facility is also preparing for the launch of the new three-door pro_cee'd, which will begin production in early 2013. The all-new cee'd Sportswagon will arrive in UK showrooms during September and although no prices or specifications have yet been announced, full details will become available at www.kia.co.uk in due course. Another Schreyer designed new KIA to be revealed at the Paris Motor Show is the next generation KIA Carens 7-seater MPV. And why is this news exactly?